DiAcro 100-10 100-Ton x 10’ CNC Press Brake s/n 685058094 w/ Autogauge CNC 99 Controls, 10’ Bed Length, 8 ¼” Throat, 102 ¼” Between Uprights. DiAcro / Promecam IT2-50- 20 50-Ton x 79” CNC Press Brake s/n 050-20- 135 w/ DiAcro CNC Gauging System Controls, 79” Bed Length, 16” Throat, 66 ½” Between Uprights. Station Turret, 40” x 40” Sheet Cap., 40” x 87” Ball-Top Table. Strippit “Fabricator” Custom 30/30 30-Ton Fabrication Punch Press s/n 13092772 w/ Single and Nibble Modes, Fence System. 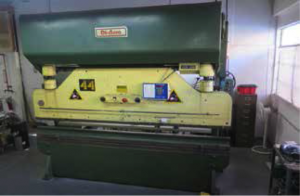 Niagara 1R6-10GA 10GA x 6’ Power Squaring Shear s/n 65217 w/ Niagara Controls, Power Back Gage, 27” Front Supports. Haeger mdl. HP6-B 6-Ton x 18” Hardware Insertion Press s/n 1254 w/ Haeger Bowl Feeder, Tooling. Ramco mdl. 25T-60 24” Belt Grainer s/n 2732 w/ 24” Belt Feed, Dust Brush System. Pexto mdl. 381D 22GA x 36” Hand Roll s/n 50 w/ Bench. DiAcro Shear No.4 24” Hand Shear s/n EB-1347. DiAcro Notcher No.1 6” x 6” Hand Corner Notcher s/n A-7034. Roper Whitney 5-Ton Kick Punch. DiAcro Bender No.1-A Universal Bender. Bridgeport Series 1 – 2Hp Vertical Mill s/n 185731 w/ Sony DRO, 60-4200 Dial Change RPM, Chrome Ways, Power Feed, 9” x 48” Table. Scotchman / Bewo Type CPO-275LT 12”Miter Cold Saw s/n 23785098 w/ 2-Speeds, Manual Clamping. Rockwell / Delta mdl. 15-655 Variable Speed Pedestal Drill Press. Wards Power-Kraft 9” Table Model Vertical Band Saw. Strippit Punch and Die Grinder. Dayton 2” Belt / 6” Disc Sander. Welding Torch Cart w/ Acces. Kaeser 7.5Hp Rotary Air Compressor. Clark C500-50 4450 Lb Cap LPG Forklift s/n 355-788- 3611 w/ 3-Stage Mast, 188” Lift Height, Solid Tires. Sheet Stock Including Aluminum, Stainless and Cold Roll. Pallet Rack, Shelving, Carts and Tables.